About & Contact - Simon Cattlin AGAvA Simon Cattlin artist, aviation artist, aerospace artist, space artist, skyscape artist, science fiction artist. I sold my first painting in 1978, having just completed my Art 'A' level, and I've been selling a wide range of predominately aviation, aerospace and astronomical art for many years alongside my more recent abstract works. I started working with oil paints when I was 13 and it's the medium I love the most; there is nothing quite like the creative anticipation of a large blank canvas to test your imaginative skills and artist quality oil paints give you a fabulously rich palette to work with. As a small boy, I'd been fascinated by all things aeronautical, and it was that constant interest that started me sketching aircraft before I moved onto expressing myself in colour. The aviation art and aerospace art markets have developed tremendously since the late 1970s, largely thanks to the superb works of Robert Taylor, Gerald Coulson and their peers. The standards created by them set the bar for me and many other artists, who are drawn to aviation art and aerospace art individually, or via the Guild of Aviation Artists, which is the world's best established and most respected aviation art association. I'm an associate member of the GAVA and submit work to the annual exhibition in London. Science & astronomy has been a constant interest for over 30yrs, to have so much of our art inwardly focused on a minutely small particle within the fabric of the universe seems almost dismissive of the panoramic intensity of the wider cosmos. In our journeys beyond the stratosphere - art goes first. I've produced numerous paintings of planetary scenes, starscapes, galaxies, deep space nebulas and well-known icons of the space age, such as the NCC 1701 Enterprise, as well as my own future craft designs. The International Association of Astronomical Artists ( IAAA) is the collective "home" for those of us who combine our love and wonder of astronomical themes with expressive original art. We bring you the images the cameras can't get to, I'm an artist member of the IAAA. I've been a keen sports pilot since my early 20's and, after several years hang-gliding, completed my PPL and began my aerobatic journey operating in a range of aircraft including Fournier RF4D, Slingsby T67, Starduster Too, Pitts Special, Yak55m and Extra EA300. Its an amazing reference platform for aerospace and skyscape themes and freestyle aerobatics is about as exhilarating as life can get. 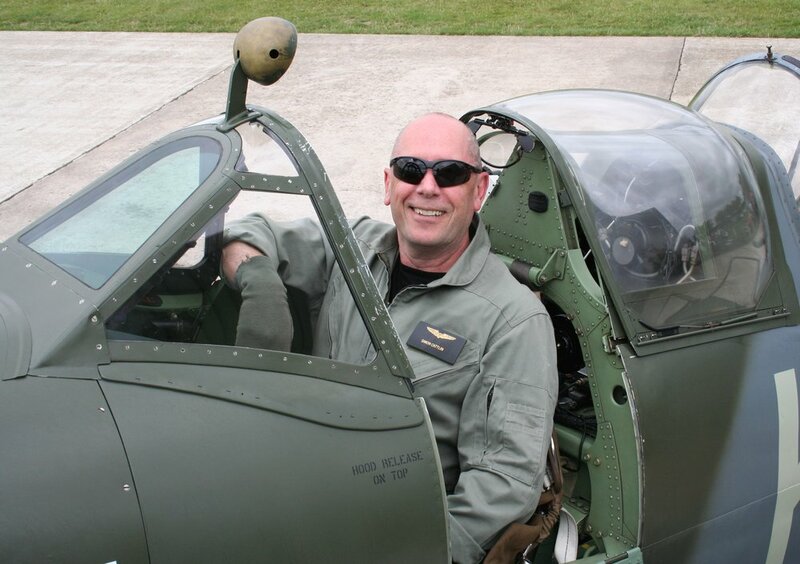 I've also flown a number of vintage types including Bucker Jungmann, Tigermoth and a Spitfire. I produce original oil paintings on canvas, MDF plus other modern surfaces like dibond. These range from 30cm x 23cm upto 200cm+ x 150cm+, I welcome commissions and can advise on framing, hanging etc. Originals can take 1-3 months to complete depending on composition and research requirements. Much of my work is published as limited edition prints and modern giclee technology allows for varying image sizes on a wide range of surfaces including fine art paper, canvas, acrylic, MDF, glass and Dibond. All my work is signed and numbered with certificates of authenticity. I also produce aerobatic cloudscape HD video clips for private and commercial clients seeking unique film footage, often set to music. I think I might be one of the world's first aerobatic video artists ! I welcome contact from prospective clients. Much of my work is sold directly and I enjoy building personal relationships with collectors, happy customers make for a good professional reputation and I take that very seriously. My studio is based in West London and I'm pleased to be able to show my work to visitors and to meet to discuss commissioned paintings. Buying via the site is very straight forward and commissioning your own painting is easy, structured and satisfying. I'm keen to work with both national and international galleries who have an interest in representing me or exhibiting my work.